(This is the first in a series of oral history narratives about WW2 in southern Italy. 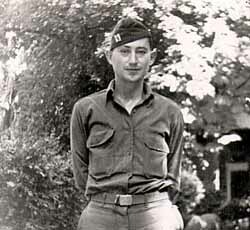 This edited narrative is the result of interviews with Herman Chanowitz, former captain in the 2nd Tactical Air Communications Squadron, and a veteran of the Allied campaigns in North Africa, Italy, France and Germany. He is a long-time resident of Naples.) A narrative from Fred Hellman starts at number 4, below. In Sicily we landed at a place called Gela. I think it was in July, 1943. The English landed near Catania and Siracusa. That was a very rapid campaign. The idea was to clear the Mediterranean of German submarines, make it tough for them to get supplies and also make it easier for us to get supplies. The big thing was to try, if possible, to prevent the Germans who were on Sicily from getting out with their equipment. We landed north of Messina; the only way you could get out was by sea—the straits there. When we got into Sicily, the Germans knew that there was no way that they could save the situation. They couldn't kick us off. All they could do was make damned certain that it took time for us to get them off, and they wanted to get off the island with all their equipment and all their men. To do that meant they had to cross the Straits of Messina. We were not able to prevent them from doing that. In spite of the fact the we had control of the air and control of the sea, they managed to get all their equipment off. This was a big disappointment because the next landing was going to be up at Salerno, and the idea was to prevent all the Germans who were on Sicily from getting up there to protect that zone. But they got out. There was some ill feeling between Eisenhower and Montgomery. Montgomery thought he knew it all. He didn't cooperate. His job was to get the Germans before they got off. But he didn't do that. He just took his sweet time, and the Germans managed to get off the island of Sicily. I got to Salerno—the next invasion—by sea. I think it was around the 9th of September. While we were on the ships going from Sicily to Salerno, there was this big announcement that Italy had given up and, in essence, were not going to fight against the Americans. That's when the king took over from Mussolini. The idea was that the Italians were not going to provide any resistance against the American landings. The Germans were very well aware of what was happening, of course, and Hitler came out and said, well, they double-crossed us, so as far as I'm concerned, if our soldiers see any Italians, kill them. There was a lot of resistance to the landing at Salerno. It was touch-and-go for a long time. The Allies came out with an announcement saying that it looked kind of bad. For a while, they talked about putting us back on ships and landing at a different location in the Salerno area. There were two different corps that were landing. We were both part of the Fifth Army. I think there was the American Second Corps and there was the British Corps. They were the ones who landed north of Salerno. The Germans almost threw us back to the sea. They were trying very hard to come down the middle and isolate us. I landed with the headquarters of the 36th Infantry Division up around Battipaglia. 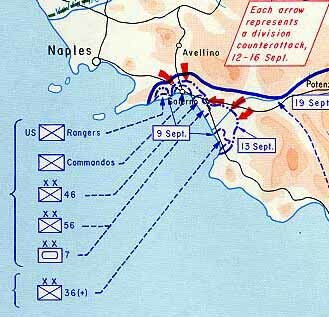 The Brits landed further north around Salerno. I remember sleeping right next to the temples in Paestum. I remember the night we saw all these airplanes coming over. Some of us thought they were German planes because the Germans had been bombing there just before the Americans came, but they were planes that were bringing American airborne troops. We did a lot of shooting, not knowing who was coming on down. They were our own troops. 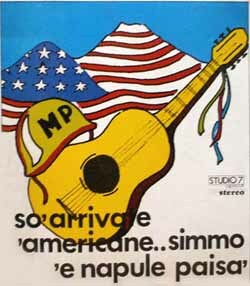 On the road from Salerno to Naples—by Nocera—we did have the Special Service forces. They landed at Vietri with the idea of going up to a path overlooking Nocera. Nocera is a city on the road that goes from Naples to Salerno, but above that is this path that the Rangers wanted to take because this would give them a good idea of any [German] reinforcements coming down from Naples. There was a big fight there. I drove into Naples—I'll never forget that—by way of the route from Salerno to Pompei and Torre Annunziata, all along the ocean. All that had been pretty badly bombed. When we came into Naples—my God, what they [the Germans] had done to that port was absolutely incredible. They had destroyed just about everything they could destroy. We stayed, if I'm not mistaken, in a palace that is now a museum. Capodimonte. We stayed there for a couple of nights. Naples had become a vital port of supply, and the Germans knew that, so they would come over at night and bomb the hell out of it. So we'd all go into underground shelters. It was funny being there with some of the Italians who had brought their own wine and guitars—with bombs going off up above. War can be hell or it can be a kind of a paradise, depending on where you are and who you are. Later, when Vesuvius erupted in 1944, I happened to be back in the Naples area because we were still stuck in front of Cassino. Air support in that kind of territory couldn't do much, so I occasionally had some time off, and they let me take a jeep and come on down to Naples. I had met Adriana, and I would go visit her. I knew some guys who flew Piper Cubs and one of them took me up with him. He was there and I was with him when he took those pictures. We weren't in danger, but the Allies had gone ahead and built an airfield on the plain near Mt. Vesuvius. All those airplanes were ruined by the ash. Also see this item on the Allied-controlled newspaper, il Risorgimento, founded in Naples in October of 1943.